If you wish to register your child, please print and fill out the appropriate form from the list at the bottom of this page and take it to your area elementary school, or deliver it to the Regina Public School Division Office. School address and contact information is available here. Please call the division office first to confirm summer hours of operation. 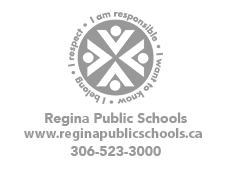 Current students of Regina Public Schools can be registered directly at the school in their neighbourhood. Elementary school-age students can also register directly at that school. Follow this link for an online resource that will help you identify your neighbourhood school. Canadian high school-age students, who are new to Regina Public Schools, or have been out of Regina Public Schools for one semester or longer, should visit their neigbourhood high school to get more information and to register. If you are new to Canada, or not a Canadian citizen (and either an elementary or high school-age student), please visit the Regina Newcomer Welcome Centre before application to Pre-Kindergarten and/or registering any new student. Pre-Kindergarten students must be three or four years of age on December 31st of the year they apply to be eligible noting that spaces available are limited. Please follow this Ministry of Education link for more details. Application is available below. Additional information regarding Pre-Kindergarten, as part of Early Learning, is available here. Regina Public Schools welcomes new Kindergarten students who will be five years of age or older on December 31st of the year they register. Please review the Ministry of Education link for more information. Registration is available below. Additional information regarding Kindergarten, as part of Early Learning, is available here. Regina Public Schools also offers French Immersion programming at some of its schools. Information regarding French Immersion programming is available here. Registration is available below. Note that the same registration form is used for both English and French Language programming. You are welcome to call Regina Public Schools at 306-523-3000 or email info@rbe.sk.ca if you have any questions. Regina Public Schools welcomes high school students throughout the school year. It is important for school staff to access current information to best meet the needs of all students; therefore, it is necessary to create a consistent and effective transition plan for students. Students graduating from a Regina Public Schools elementary school can apply directly to their local high school. Click here for the school locator. Read about the high school strategy here. are registering with a social worker or community public safety worker. To find your local high school, please visit the school locator and input your street name, then follow the steps. Click here for the school locator. If you wish to enrol your child in a school which is outside the attendance area, you must complete the School Enrolment Exemption Application Form found in the documents below. For more information, please contact your local Regina Public high school.